While gangs moved right into the the liquor business as soon as prohibition went into effect, things were fairly quiet for the first few years – the gang’s territories were well carved. But in 1924, things began to go sour. Dean O’Banion, head of the North Side gang, called Johnny Torrio of the south side gang and offered to sell him his business for half a million bucks. Torrio was only too happy – but the deal was a trap. When he showed up to pay O’Banion, cops arrested him. He lost the money, got a jail sentence, and never got the business, which O’Banion happily kept for himself. 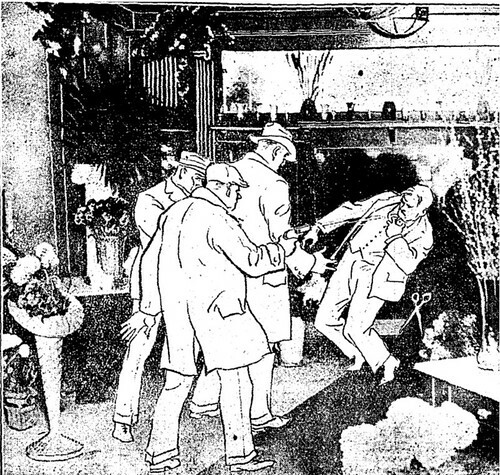 But things stayed quiet until November, 1924, when politician Mike Merlo, who had helped keep the peace, died. Two days later, three gunmen including Mike Genna went to Schofield’s Flowers, a State Street flower shop O’Banion co-owned as a day job. He shook hands with one of the men – who pulled him forward while another shot him repeatedly. next: the death of Hymie Weiss….